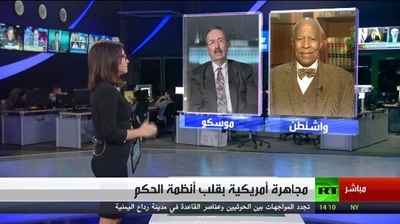 Professor Raymond Tanter appeared on Russian TV on 02 February 2015.He talk about Obama Yes toUkraine Protests; No 4 Year 2009 Iran Protests by PMOI CampLiberty NCRIUS Iran_Policy. The Russian Foreign Minister Sergey Lavrov announced that US President Barack Obama, first recognizes the contribution of Washington in the "transfer of power" in Ukraine which demonstrates the involvement coup. To watch the complete interview please go to: Russian TV Arabic.